Street Address line 2 City Postcode National Insurance No. Unique Learner No. Guide note: you will find this 10-digit candidate number on any of your award certificates or results slips. If you can't find them, please phone your school or college. If you simply cannot track down this ULN then please just enter 1234567890 in the application form. Not having this ULN will slow down your application process though. If ‘Yes’ for how long? Do you have a bank or building society account? Which London Borough do you live in? Are you currently in receipt of active benefits? If ‘yes’ what benefits are you receiving? How long have you been receiving this benefit? Are you on the Work Programme? Are you currently studying at a college? If ‘yes’ which college are you attending? If ‘yes’ what course are you doing? How did you hear about K10? What age did you leave school? GCSEs, please let us know why? Do you live in Social Housing? If so specify which association Do you have a CSCS card? Do you currently hold a valid driving licence? Please include all work experience, paid or unpaid, construction or non-construction specific. If dates are unknown please tell us how long you were there for. Please include GCSE’S, BTEC’s, NVQs and/or in-house training in previous employment. Please can you provide the details of 2 professional referees that we can contact should we progress with your application. These should be either an employment or education referee. Health & Safety and relevant qualifications therein are of crucial importance in all sectors but become of critical importance in the Construction Industry. A construction site is regarded as a 'safety critical' area of work and therefore H&S is something that needs to be taken very seriously from the beginning. Whether you are pursuing a career in construction or in banking/professional services, please could you detail any Health & Safety qualifications you have gained below e.g CSCS, Level 1 Health & Safety Diploma. ​If you are looking to get into construction then you will need a CSCS Card and you should start revising as soon as possible. Starting with watching the following Health & Safety video. Please tell us in the box below what trade or area of construction you wish to develop in. What would being an apprentice mean to you and what do you think being an apprentice involves? Tell us about yourself in 100-150 words. Consider hobbies & interests. What motivates you? Where do you want to be in 3-5 years’ time? UNDER THE GENERAL DATA PROTECTION REGULATIONS, WE HAVE A LEGAL DUTY TO PROTECT ANY PERSONAL INFORMATION WE COLLECT FROM YOU. We will only use personal information you supply to us for the reasons that you provided it for. We will not pass your information to any other parties unless this is made clear to you at the time you supplied it. In this instance, we will share your information with prospective clients and training providers to help support your apprenticeship application. I sign to declare that the information I have provided is correct to the best of my knowledge. I understand that any deliberate omission or falsifications could result in the rejection of my application. I agree to allow my data to be transferred to the assigned project evaluator by either a delivery partner (or lead partner) or the GLA to assist with the final project evaluation and/or for GLA monitoring purposes. I confirm that I do not knowingly have any existing medical, physical or psychological condition that may prevent me working in the construction industry in a manner safe to myself and others. Do you have any convictions, cautions, reprimands or final warnings that are not “protected” as defined by the Rehabilitation of Offenders Act 1974 (Exceptions) Order 1975 (as amended in 2013). The amendments to the Exceptions Order 1975 (2013) provide that certain spent convictions and cautions are ‘protected’ and are not subject to disclosure to employers, and cannot be taken into account. The following questions are for monitoring purposes only and your answers have no bearing on your suitability for an opportunity with K10. We ask these questions to ensure our procedures are fair and also to measure the social impact our organisation has on individuals. What do you consider to be your gender? What do you define as your ethnic group? If ‘yes’ please indicate the nature of your disability and outline any adjustments to the workplace you may need to assist you for the purpose of (a) interview and (b) the job. How would you summarise your current state of health? Have you suffered any mental health issues? If yes, please state the medication you are currently taking. Do you have any other dependents / are you a carer? THIS QUESTION IS USED TO HELP K10 UNDERSTAND THE IMPACT OF ITS WORK. YOUR RESPONSE WILL NOT HAVE ANY EFFECT ON THE RECRUITMENT PROCESS OR YOUR TRAINING OR WORK PLACEMENT.. Please imagine a ladder with steps numbered from zero at the bottom to 10 at the top. represents the worst possible life for you. 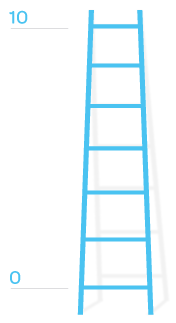 On which step of the ladder would you say you personally feel you stand at this time? On which step do you think you will stand about five years from now? When you are ready to submit your application please click the Submit button below and wait until your application is fully submitted, this might take a few seconds. Please don’t refresh your browser.